Victory is ever sweeter when it’s stolen from your opponent’s hands! What the Shell is a new kind of board game that gives you amazing satisfaction. Oh No, this ain’t your traditional static five-in-a-row game, but an original invention that is fast-paced, deeply strategic and dynamic. Nothing is inevitable, and the game is never won or lost until the very last moment. Our unique twist of simultaneous play makes every turn exciting and unpredictable. If both players go for the same space, a neutral egg blocks the space. 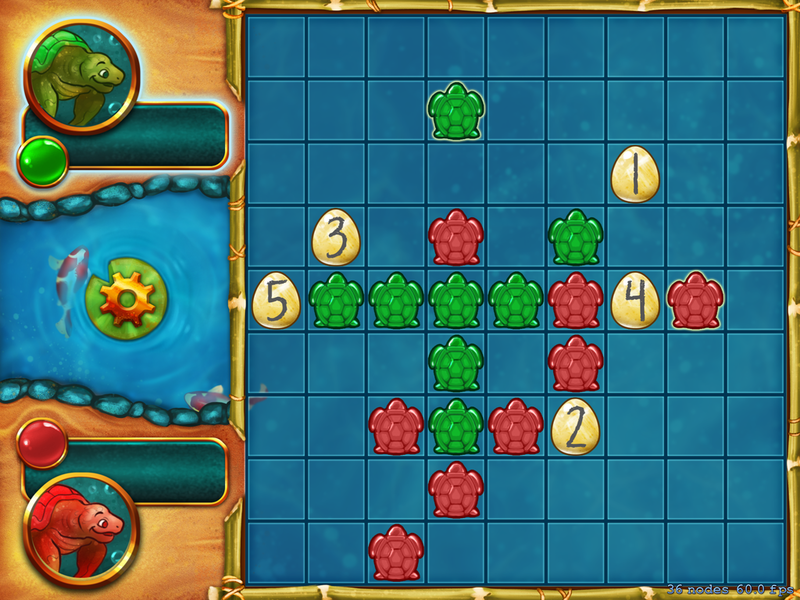 The players can capture each other’s turtles, which also allows them to claim a neutral egg. This encourages aggressive play and makes for dynamic back-and-forth gameplay. Enjoy the look on your friend’s face when your capture leads to a chain combo that devastates their beautifully set up position. What the Shell’s simple yet deep gameplay will keep you on your toes and always coming back for more! Challenge a friend today in this modern battle of wits. Try Ludisto’s unique new twist on this beloved classic, Poker Solitaire (or Poker Squares). Ludisto’s original innovations on the classic formula makes it even more fun and challenging. Whether you’re a newbie or an expert, our interactive tutorial eases you right in. You can finish a game in minutes: perfect for a quick break. Or binge with the addictive gameplay and watch your strategy evolve. Brag on Facebook and Twitter, and once you’ve mastered Ludisto’s original scoring system, mix things up with the American scoring system in our Premium version, along with other goodies. Just play it and love it. Party fun and a nice atmosphere guaranteed! Have you had enough of playing apps by yourself? Then grab this for your friends and get going! The more the merrier as this game pushes you to your limits! Get your friends to say the magic word while avoiding the forbidden words and race to the finish line. It’s also a great way to build your creativity!